Thinking back on a wonderful summer, and likely my last in the US for some time - I spent a few days in the Adirondacks working, and managed to hike into one of my favorite places to do some night photography. 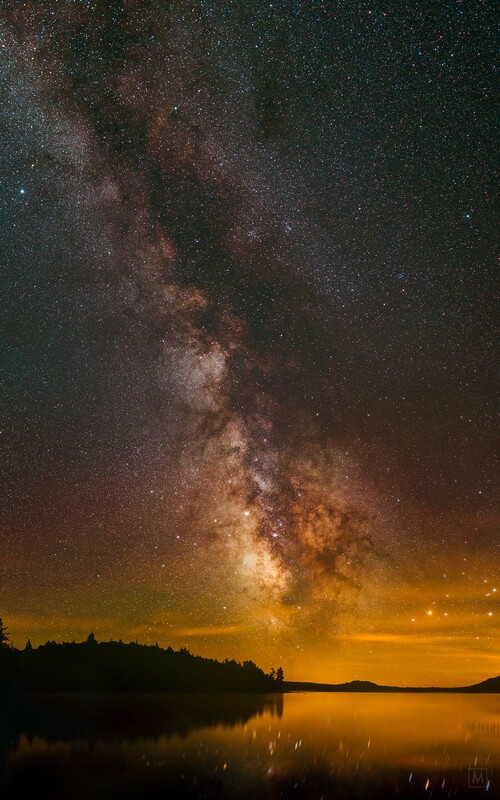 This is a slightly re-processed image of the Milky Way over Lake Lila, in the heart of the Adirondack Park. This multi image mosaic was shot with a Vixen Polarie tracker aligned to Polaris. The tracker rotates at the same rate as the earth under the stars - so once aligned longer exposures are possible. I took two images for each of 12 camera positions for the sky and stacked / medianed them to knock down the noise. I then stitched the stacked images from the sky and combined them with 3 images that were stitched for the foreground and lake that were taken at the end of the sequence without the star tracker running. The image took over an hour to acquire, (plus the hike in, waiting, and hike out) and countless hours processing as I'm still learning how best to process mosaic astro landscape images. That gave me chills. Beautiful, thank you. That's a beautiful picture. I hope that you'll have nice outdoor places wherever you're going next. Thank you Don. Photography has been a labor of love. Hoping to see more photos in the long run. I don't know what's more impressive, the picture itself or the method by which you've whittled it from the sky. Yup, might have taken a long time to capture.